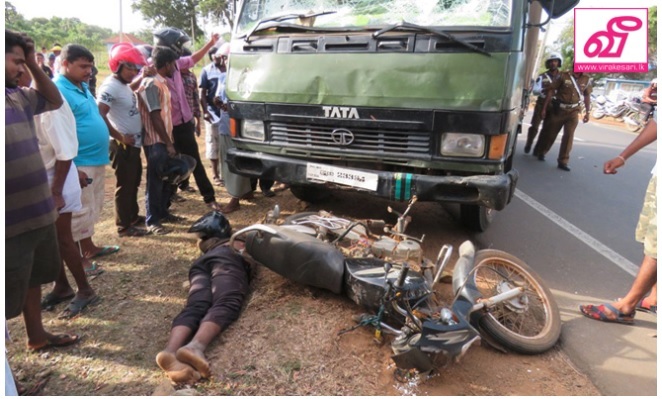 A Sri Lankan military truck hit and killed a Tamil man riding his motorcycle in Kilinochchi on Wednesday. The man, identified as a 51-year-old resident of Bharathipuram in Kilinochchi, was reportedly pronounced dead at the site of the collision, at the 155th milestone. Sri Lankan police are reportedly investigating the incident. Warning – some readers may find the photograph below distressing and discretion is advised before viewing.